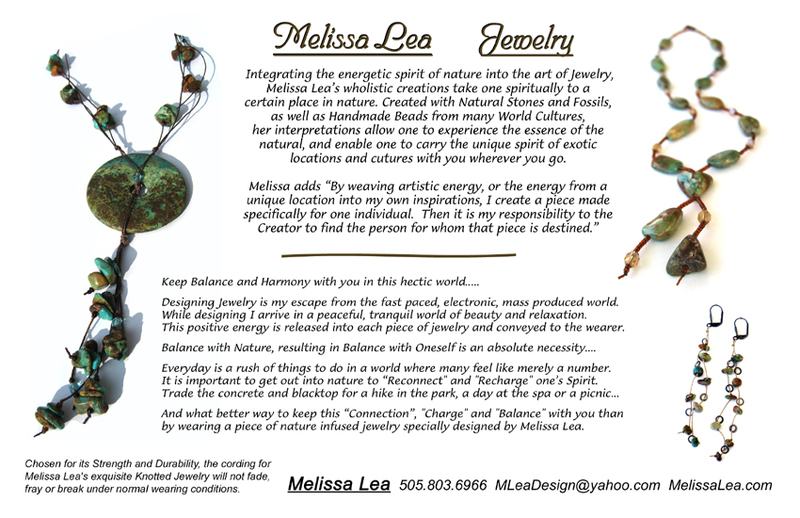 Integrating the energetic spirit of nature into the art of Jewelry, Melissa Lea’s wholistic creations take one spiritually to a certain place in nature. Created with Natural Stones and Fossils, as well as Handmade Beads from many World Cultures, her interpretations allow one to experience the essence of the natural world and carry the unique spirit of exotic locations and cultures with you wherever you go. Designing Jewelry is my escape from the fast paced, electronic, massed produced world. While designing I exist in a peaceful, tranquil world of beauty and relaxation. This positive energy is released into each piece of jewelry and carries over to the wearer. Everyday is a rush of things to do in a world where many feel like merely a number. It is important to get out into nature to reconnect and recharge ones Spirit. by wearing a piece of nature infused jewelry specially designed by Melissa Lea. Chosen for its strength and durability, the cording used for Melissa Lea's exquisite Knotted Jewelry will not fade, fray or break under normal wearing conditions. ​Click onto article to enlarge. 2nd place Best Local Artist.